At the end of September, and for the first time, Rheinmetall took part in ELROB with its unmanned multi-mission "Mission Master" vehicle. At Europe's largest exhibition for military ground robotics, Rheinmetall's Mission Master team entered the fray, taking on a number of competing teams. 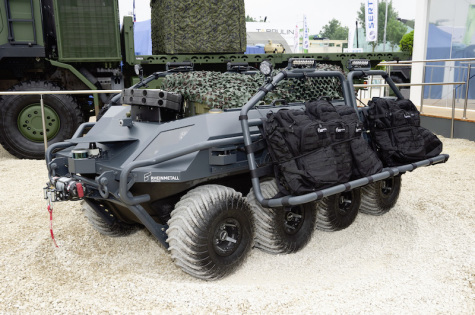 Made by Rheinmetall Canada, the cargo version of this versatile vehicle turned in a particularly compelling performance in the "Mule" category. The teams each had thirty minutes to cover a 1,400 m-long route with their mule. The cargo version of the Mission Master was exhibited to a large group of defence specialists for the first time at Eurosatory 2018. Rheinmetall developed this variant to reduce the combat load carried by troops in the field, contributing to faster movement and greater operational efficiency. Rheinmetall's new robotic vehicle can operate in hazardous, difficult-to-reach terrain, in turn contributing to the survivability and protection of troops deployed in harm's way. Moreover, the Mission Master can be networked with advanced soldier systems such as Future Soldier – Expanded System, Gladius 2.0 or Argus. In Rheinmetall's "System Infanterie", the Mission Master serves as a force multiplier for infantry sections or squads equipped with Rheinmetall's Future Soldier – Expanded System technology. Fully networked with dismounted combat troops, it not only takes a weight not only off the soldiers' shoulders, it also relieves the pressure on military leaders.